Easter is a time of rebirth and renewal, when we know that the dormant world around us is reviving and once again budding. Reflecting that at tea time is easy to do with a few key ingredients. Just about any color is appropriate here, but it should be in a pastel shade. The lighter color conveys the more bright and sunny days of Spring after the gray days of Winter. You can pick 2 or 3 colors for a scheme here. Pink and green are one option. Blue and yellow are another. Lilac goes with a variety of colors: green, yellow, and orange. Or you can go all out and have all of these colors together, just like the flowers blooming around you. Symbols of the season reflect that sense of rebirth. Bunnies, chicks, lambs, lilies, daffodils, tulips, and eggs are the common ones. Having plenty of these in ample supply on your tea table will be an assurance of the occasion being celebrated. They can be in the form of statues, pictures, the real thing, or (my personal favorite) made of chocolate! Just as in real estate, when it comes to tea time, location matters. 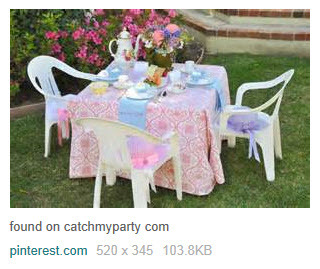 Weather permitting, try to set up your tea time outdoors. If the forecast shows that this would not be a good idea, be sure the location indoors is well-lit and near windows if possible. Even a rainy day (as long as it’s not too wild and woolly out there) will add a nice air to your Easter tea time since there will be more greenery and floral colors outside this time of year than in Winter (assuming you live in an area where all four seasons are evident). Tablecloths and napkins set a tone that says the occasion is a bit extra special. Matching seat cushions or chair covers will enhance that feeling. A centerpiece using some of those traditional symbols above will also set a tone, either more adult or more geared toward younger guests (for example, realistic bunnies versus more cartoon-like bunnies). A plate, teacup, saucer, and water glass at each guest place will be very welcoming. Don’t forget forks, spoons, and knives (depending on what foods you’re serving). Don’t forget the most important ingredient: a sunny disposition!